This Chocolate Avocado Smoothie (Vegan & Gluten Free) recipe is sponsored by Navitas Organics. I know we’re all obsessed with Thanksgiving recipes right now and stuff, but today I’m interrupting the slew of mashed potatoes and pumpkin pie for a little detox action! 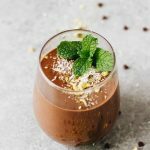 This Chocolate Avocado Smoothie (Vegan & Gluten Free) happens to not only be incredibly delicious, but loaded with nutrition! Don’t worry, we’ll get right back to that fall food life here in a little bit. But to be honest, I NEEDED this chocolate avocado smoothie. I don’t how it’s been for you, but for me it’s been ALL THE EATS. All the sweets for Halloween, all the comfort food for fall in general, eating out a ton because #EdnaTheHouse (read about our last update here), and now all the Thanksgiving indulgences. Taking a break to focus on nourishing my body and detoxing a little bit before the holidays hit is just what I needed! This Chocolate Avocado Smoothie is vegan, gluten free, easy to make and delicious! Think creamy, silky, thick chocolatey goodness that’s sweet and basically dessert in a breakfast drink. Not to mention that it’s loaded with wonderful nutrients, thanks to Navitas Organics’ Essential Blends and Daily Boosts! I’ve always wanted to be one of those smoothie girls who mixes in protein powders and greens, but I just never have been. I’ve never been a fan of the way that those types of powders *typically* taste, ya know? But YOU GUYS. The Cacao & Greens Superfood Essential Blend + the Detox Daily Superfood Boost from Navitas Organics mixed in with avocado, agave, cocoa powder, banana, and almond milk….next level, y’all. NEXT LEVEL! I love that Navitas Organics’ has several options for their essential blends and daily boosts. I had several options to mix into this smoothie – detox, focus, wellness, and beauty boosts! So easy to use and loaded with goodness! Here’s how to make this Chocolate Avocado Smoothie! Big shoutout to Navitas Organics for sponsoring this Chocolate Avocado Smoothie and loading it up with delicious blends and boosts! I love that Navitas powder! This looks so creamy and chocolatey – can’t wait to try it! Me too! It’s the best 😉 Enjoy! I would use DAILY SUPERFOOD FOCUS BOOST in my smoothie, because I’ve been under a lot of pressure and the stress is wearing me out. My elderly parents aren’t well and my mom has to go into the nursing home this week. I’m so sorry to hear about your parents, Annette! Hang in there, friend. The daily superfood focus boost is definitely perfect for this season and difficult times of focus! This looks super creamy and chocolatey! What more could you ask for?! I’d want to use the focus boost in my smoothie and hope it’d help with my terribly short attention span lol and so I can get better at sudoku. But I want to try all these boosts, they look amazing and I need them asap! That’s so awesome, Ashley! They are so good 🙂 Enjoy! YUMMMMM this is so dessert worthy and not just one of those must do healthy things, but a really treat that will satisfy! !